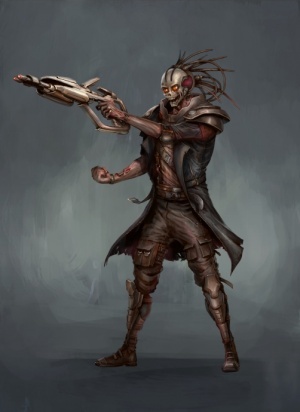 The Bushraki are a very humanoid race that is augmented from birth with cybernetics due to their unique ability to accept extensive implants without biological rejection kicking in, resulting from the Sa'hak-ren race implanting Cleax genes in them. The Bushraki are one of the most-despised races in Starmourn, finding general acceptance only in Scatterhome. They're a race defined to others, in the modern age, by three main characteristics: their universal, often-extreme cybernetic enhancements, their pervasive love of drugs of all kinds, from recreational to performance-enhancing, and their unstable, hair-trigger personalities. Previously unknown to most of Starmourn, they gained their infamy during the Bushraki war, when they were used by the Ishvana to invade Starmourn sector. Around 1400 B.E. the Sa'hak-ren Hierarchy developed a new kind of advanced medical tech based on the unique genetic material harvested from the Cleax, who heal more quickly than any other known race. Someone near-death from grievous injury could be healed in a matter of hours, using injections that caused the body to rapidly and aggressively repair itself, regardless of race. Using this rapid-healing medtech, the Sa'hak-ren, who are masters of genetic manipulation, albeit in a manner completely different from that of the Fatar, began to experiment on the nascent Bushraki people, who hadn't yet left their home planet of Dikamazi. For a thousand years, the Sa'hak-ren treated the Bushraki as their personal laboratory, vivisecting them and then healing them, poisoning them and healing them, hitting them with lethal doses of radiation and then healing them, and so on, always without any pain relief. Eventually, the Sa'hak-ren decided to begin breeding Bushraki to be shock troops for the Hierarchy, enhancing them at birth with cybernetics that would greatly increase their potency. What they found, however, were the same problems that have plagued development of serious cybernetic enhancements across Starmourn: the biggest enemy is the body itself, rejecting the enhancements. Of course, for as long as any race could remember devices had been implanted in bodies, from the simple pacemakers of old Earth to lab-grown organ replacements and cryptographic key systems, but the kind of cybernetics envisioned by the Sa'hak-ren went far beyond this. They envisioned Bushraki with enhancements that were deeply entwined with all the body's systems, from musculoskeletal to endocrinal to cardiovascular to nervous and more. The trouble was that the procedures they had to perform on the Bushraki were so invasive that vivisection was merely the beginning, and even with the healing tech engineered from Cleax genes, the Bushraki couldn't survive this kind of all-out assault on their bodies. Through a series of breeding experiments, the Sa’hak-ren were successfully able to implant some of the Cleax genetic material into fetal Bushraki, and on maturity these unfortunates were brutally torn apart and put back together again. This time, they survived. Within a generation, all Bushraki in the womb were routinely subjected to this manipulation of their very essence, and the old Bushraki died off with age, or disease. The Bushraki were no longer what they were. They had been a contemplative race preferring to dwell in or near forests, and to pass their days creating or appreciating art, literature, music, and vigorous sport in the company of other Bushraki. Even throughout the generations of slavery to the Sa'hak-ren, and despite their burning hatred of their masters, they maintained some semblance of that former spirit. The introduction of the Cleax genes changed everything for them. Physically, of course, they no longer resembled natural beings, full of enhancements both organic and technological, but far more important was the change in their emotional and cultural makeup. They became an enraged, broken race. Violent crime rates on Dikamazi soared, and many of the new Bushraki simply hunted the old Bushraki down, who regarded their descendants with a combination of pity and horror. Hate was now the byword of the Bushraki. Hate for the detested Sa'hak-ren. Hate for what they had become. Hate for what they had lost. Hate without hope. Hate without future. The new Sa'hak-ren were thrilled, and the Bushraki were used to help subdue the Xariel, who remain a client race of the Sa'hak-ren Hierarchy to this day. However, Life rarely deals you a good troom deck without making you pay for it later, and as the Sa'hak-ren discovered, you can have too much of a good thing. After tasting battle against the Xariel, the Bushraki largely ceased their in-fighting, turning their substantial aggression against them and steamrolling across their planet. None had ever seen warriors capable of withstanding what the Bushraki could, and with their enhanced strength, speed, and reflexes, they were more than just formidable. The Bushraki fought like madmen, taking incredible damage and continuing to battle, thanks to the wetwiring tech the Sa'hak-ren had created with the Cleax genetic material. When the conquest was over, however, the Bushraki lost none of their hate, none of their bloodlust. They began to fight each other again, and, in what should have never been a surprise, the Sa'hak-ren themselves, in increasing numbers. They became completely unmanageable, and so destructive (and self-destructive) were they that the Hierarchy eventually simply abandoned their millennia-long project and left the Bushraki to their own devices on Dikamazi. With the departure of the Sa'hak-ren from their lives, the Bushraki rejoiced, but their fundamental nature didn't alter. Though they had now left their planet, they only possessed a few ships capable of interstellar travel, stolen and hidden from their former masters. They had also learned enough about the technology used to alter Bushraki in the womb and then implant them with cybernetics that they were able to continue this practice, wishing to maintain their race's strength. Painkillers were now a key part of the enhancement process, of course. Some races in Starmourn sector had become aware of the existence of the Bushraki, but those that had knowledge of them were also aware of their nature, so largely ignored them. They were considered little better than violent, primitive beasts by many. One race, however, saw opportunity: the Nabia. Always looking for new markets for the wide variety of drugs they manufacture and peddle, they came to the Bushraki offering a trade: the rare hardwoods from your planet's forests for ships from the Nabia, and permission to establish trading posts on Dikamazi. The Bushraki leadership eagerly agreed, for what they wanted more than anything was revenge on the Sa'hak-ren, and building an armada would be required. The ships were really just a distraction, meant to keep the Bushraki from thinking too much about the Nabia's real motivations. The Nabia had, quite presciently, seen that a culture of broken souls filled with hate would be the perfect fit for their addictive products, and the cherry on top was this new wetwiring tech the Sa'hak-ren had built into the Bushraki. Wetwiring, as we now know, allows fluids stored in small containers to directly enter the relevant body systems. Though it was originally intended for use as the most efficient way to deliver the Cleax-derived healing meds, theoretically any liquid substance could be used. It was not difficult at all to begin to tempt and addict young Bushraki. The Nabia would begin by offering them performance-enhancing drugs like temereen and vitalis, which they would slowly start lacing with addictive drugs such as glitter, black nova, and whisper dust. Within two decades, Dikamazi was one of the Nabia's biggest markets, and addiction to recreational and performance-enhancing drugs was an epidemic. Few Bushraki abstained. This heavy drug use did nothing to civilize them or tame their tempers, frequently exacerbating their unstable and violent tendencies. Dikamazi became one giant drug den, and one of the most infamous places in Starmourn. Those of other races would visit seeking the secrets of wetwiring tech, and if they weren't killed in a random brawl or murdered for fun by a Bushraki high on glitter, they would leave disappointed. The Bushraki knew that their enhancements and the technology behind them were the only real bargaining chip they had other than natural resources. And so it went for several hundred years. The Bushraki failed to make much headway in their eventual goal of revenge on the Sa’hak-ren, instead spending their time high out of their minds. Their wetwiring and other enhancements ensured that the drugs didn't kill them or even seriously damage their health, addiction-aside, so they didn't suffer the kind of physical degeneration one would normally expect. And then, one day, the Ishvana made contact with the Bushraki. It offered them two things: Technology called the 'mindsim' - effectively a tiny processor array with huge local storage capabilities wired directly into the brain - that would dramatically increase the efficiency of both their wetwiring and their other cybernetic enhancements - and a pledge to help them exact revenge on the Sa'hak-ren Hierarchy. In return, the Ishvana required the Bushraki to help it war against the races of Starmourn sector, which the Bushraki were only too happy to do, while it searched for technology to transcend and seek out the Empyreal it believes lies on the other side. Along with the Vendal, the Bushraki stormed into central Starmourn in the Bushraki War, beginning in 18 A.E., named as such because the other races of Starmourn did not yet know that the Ishvana was the driving force behind the war. For the next 16 years, the Bushraki threw themselves with gusto into the war, but they and the Vendal were finally overmatched by the combined might of the newly-formed Song Dominion, and its hired Free Fleet, led by an aging Admiral Mezer Juul and seconded by Maddox Khan and Akari Lane. Somewhat confusingly-named to the layman, the First War of the Ishvana is really the second of the Ishvana wars in the modern age, after the Bushraki War. Regardless, this war, launched in 72 A.E., was fought much as the Bushraki War was, but with even greater numbers of Bushraki and Vendal. After the Bushraki decimated the planet Song in a final assault, the war was essentially over, the Ishvana having failed, again, to find what it sought. By now, over 200 years after the Ishvana had given the Bushraki the mindsim tech, and pledged to help them exact revenge on the Sa'hak-ren, the Bushraki were angry. Though they had benefited from mindsims, they felt it was long past time for the Ishvana to help them attack the Sa'hak-ren. They demanded a fleet of their own in recompense for their assistance, and the Ishvana agreed. Unlike the First War of the Ishvana and the Bushraki War before it, this time the Ishvana was seeking to capture as many kith-using individuals as it could, which, as we discovered later, was how it created the Vihana. Unlike those two wars, however, this time the Ishvana had recruited new allies, and unfortunately for the Ishvana, it dramatically underestimated the Bushraki's reaction to this. On the new Bushraki fleet arriving at the first battle against the Celestine Ascendancy and the Song Dominion, they find the Ishvana's forces consisting of the Vendal, as expected, but also its new ally, the mighty Sa'hak-ren, and their client races, the Xariel and Inorni. The Bushraki are furious, and contemplate simply attacking the Ishvana's other forces on the spot. Instead, they bide their time, battling the Ishvana's enemies during those initial battles, waiting for the right time to turn against the Ishvana and begin slaughtering Sa'hak-ren. That time came when the Jin, fleeing their mad Godking and his alliance with the Ishvana, entered Starmourn, and this war like a hammer striking a forge. The Ishvana forces were heavily damaged, and the Bushraki took this moment to betray the Ishvana, secretly negotiating with the Celestines and Song for amnesty in return. The Jin and the Bushraki additions began to turn the tide of the war. Further, in a surprise, fleets from both the Zinari Imperium and the Ibyssian Brotherhood arrived. Together, they were able to push back the Ishvana, though as was later discovered, the Ishvana had succeeded in its plan to kidnap thousands of kith users. Unfortunately for the Bushraki, the cost of their betrayal was very high indeed. The Ishvana asked the Sa'hak-ren to exact revenge for it, and the Hierarchy was happy to oblige, disgusted by the race they had effectively created. They devastated the Bushraki homeworld, leaving it a ruined mess, as the Bushraki had done to the planet Song, and the only survivors were the deployed military forces on the fleet given to the Bushraki by the Ishvana. The Bushraki were now homeless. Though they had been given amnesty by the forces opposing the Ishvana, the Zinari, the Ibyssian Brotherhood, the Song Dominion, and the Celestine Ascendancy all declined to permit the Bushraki to settle in their territory. Though they may have been temporary allies, most of Starmourn still viewed the Bushraki as dangerous, drug-addled savages. The one place to essentially shrug and give them a half-hearted welcome was Scatterhome, perhaps because the unexplained physical resemblance between Humans and Bushraki made the Human-dominated Scatterhome more comfortable with them, perhaps because Scatterhome is simply a place much more tolerant of deviant behavior, including both drug use and violence. And so they settled in Scatterhome, and became part of it, sometimes for the worse, such as those who haunt the slums of Oldtown, preying on the weaker, or the better, such as those who joined Scatterhome’s defense forces and have kept it safe from potential predations by both the Song and the Celestines. With time, many of the Bushraki became valued, if somewhat untrustworthy, allies with the others in Scatterhome, and inevitably, the Bushraki gave up the secrets of wetwiring and mindsim-brain integration to their allies. With Scatterhome’s somewhat anarchic nature and weak ‘border’ security, the knowledge of how to produce and integrate that tech spread to the commsphere, and from there it became common knowledge. Today, only the poorest beings don’t possess a mindsim], and most who expect to face real physical danger have wetwiring installed. “The strong physical resemblance between the old, unaltered Bushraki and Humans have prompted much speculation in the geneticist community in Starmourn sector, and markers on their genetic material produces results that are either patently false, or which must cause us to reconsider our conceptions of the origins of life in our galaxy. The most fascinating part of this mystery is not whether the science is wrong – and it may be – but whether these analyses of the Bushraki truly indicates that their race’s age is as incalculably old as it appears to be. The limited analyses they’ve allowed to be performed have concluded that they are either older than the oldest-known Elder Races, including those of the Wild Kith empires that preceded the Worldbreaking, or are almost genetically unique. In the latter case, it is assumed that for some reason the markers used to roughly estimate the time period in which the race evolved (‘precise’ only to the extent of half a million years’ precision, so not useful for anything but the Elder Races and the oldest of the Younger), are simply different enough in the case of these two races that they lose meaning in our scientific context. That latter theory is more widely accepted when it comes to the Humans, who are from across the galaxy, far from Starmourn sector. It’s more difficult to accept that theory as regards the Bushraki­ though, whose homeworld is within Starmourn sector, if on the outskirts. Genetic dating relies on looking at tiny ‘imperfections’ in a race’s genes, and comparing them to other races. Commonalities are identified and once you can establish one race’s age definitively, you have a basis for taking an educated guess about the others. We have only theories as to why this appears to work – why these tiny ‘nicks’ in the genetic material can be used to age a race compared to another race whose age is known, though only very roughly, as mentioned above. What causes these little irregularities on a race-wide basis is theorized to be high-energy events permeating the galaxy during the formative years of a race, though what the extent and variety of these cosmic events are is unknown. For instance, it’s very easy to tell whether a race originated before or after the Worldbreaking, but there are no other events known that would have resulted in that much energy bathing the galaxy at once. Neither the Bushraki nor the Humans claim to have any cultural memory that would indicate their races are so ancient, and this also prompts multiple theories on the part of those who accept the idea that their genes do establish their approximate age. Of course, none of this explains why these two races, only relatively recently evolved to the point of spaceflight, appear to originate so incredibly long ago, and are so physically similar, in the case of unaltered Bushraki. This page was last modified on 10 August 2017, at 00:12.